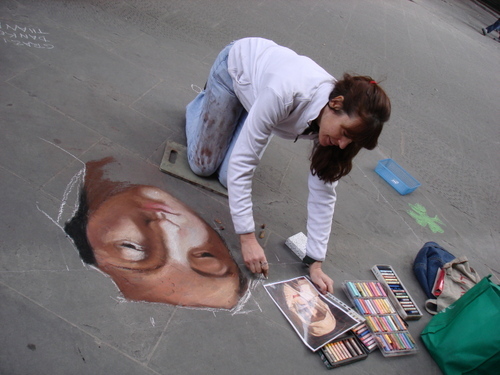 Today, streetpainting.tv is pleased to have an interview with Kelly Borsheim, a Madonnara working in Florence, Italy. Her work as a sculptor as well as her street painting are not to be missed. Links to her blog in which her work can be seen are in this post. How you got into street painting? How many paintings do you make a year? I am a new artist, and we have limited spaces here in Firenze. But if all goes well, I can make maybe 20 or more this year. What inspires you in your image choices? I choose to draw an image that will challenge me and hopefully connect with my audience. Being a sculptor, I tend to choose images that invite one to want to touch. Do you get to choose your own image or interpretation for the event (or at your square)? I love the interaction with the people who stop to look and/or chat. How long does it take you to make a street painting? Here in Firenze, our space is a little less than a 10’ x 10’ space, I think. I generally start around 1:30 in the afternoon and finish by 8 pm in the winter, midnight if the crowds are out (generally summer). We have a rule here only to have one artist make a drawing within one space. On occasion, we work together to make one large drawing. We did this recently (March) when we were demonstrating to try to get the Comune to lower the street art tax (raised dramatically on 1 January 2008) for our permits to draw each day. I had seen this small serene portrait at the Ringling Brothers Art Museum in Florida two years before and it stuck in my mind. I got such a great response from the people in Florence that it was a shame to wash her away at the end of my day. On the other hand, my drawing was only a copy of another’s work and I learned a lot from doing it, so the positives outweighed the negative. Although, after being asked by several Italians if I painted on “tela” (canvas), I went home and painted on “legno” (wood) a copy of “The Blue Madonna” and sold her off of my blog the next day. 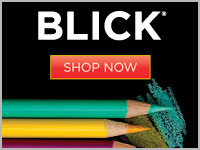 Does street painting relate to other work you do, are you an artist full time? I am a full-time sculptor and painter of fine art. Since drawing is the basis of all the arts, street painting gives me another way to learn drawing. Before street painting, I had never worked on a horizontal surface, or that large, or in color. 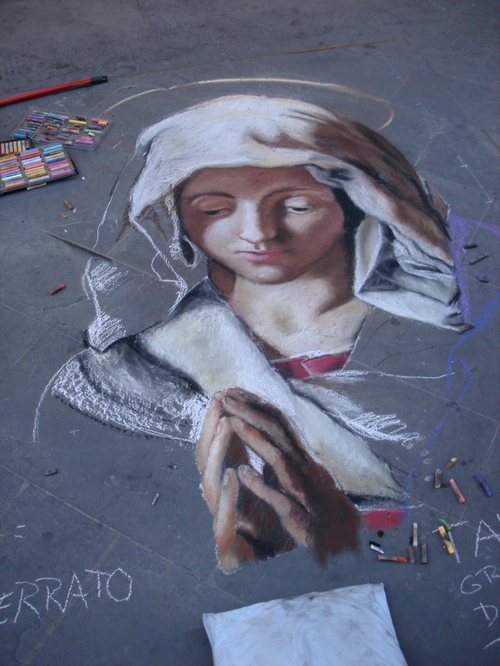 What do you like best about the Italian/European street painting festival atmosphere? I have not done a festival yet, but I am loving the camaraderie of the street painters. Sometimes we have language difficulties, but somehow manage to communicate through art and teach one another. It is quite cool. Do you have any amazing/interesting/crazy stories to share with us? - anything from traveling with the chalk and the whole security issue, to having an impromptu assistant from the audience, or something a spectator may have shared with you. I have had some funny stories that are vaguely related to street painting, but I think they are more stories about Italia. But mostly I am touched by people who stop unexpectedly, as though they never expected to see art in the street. And I try to leave chalk out so that people can write “Thank you” in their native tongue. I have gotten my largest tips from Texans who often say, “You are making Texas proud.” While secretly I wonder if they are maybe a little disappointed that they traveled across the ocean to see someone from their own country. But thus far, these things seem of little importance. What is the funniest thing that ever happened to you or the funniest things people have said while watching you? Hmmm. Well, I did have one young boy say, “Oh, I could do that!” I handed him the chalk so I could have a break, but he would not accept it. How do you decide what your subject matter will be? I try to find an image that can teach me something I want to learn, as well as one that might connect with my audience. I examine original artwork printout and decide where to fit the composition into the space I am working in and then create the grid around the face. Once I get the face drawn in, I can relate all else to it. I work from a printout (Internet Café) of an image I took off the Web of a classical work of art. How do you start? How do you transfer your sketch to the larger size on the pavement? How do you apply the color? I do not claim to use a proper technique for pastels, but I first scratch in the light and dark shapes. I try to layer colors in each of these areas after I do this. Then I mush all together with my hands. The sculptor in me needs to touch the art and blend the tones. I start with the face first and then work outwards. I am a bit of a klutz and wear plenty of the pastels without needing to add to the fact that I must climb over existing work to reach something more in the center. What other tools do you use when working? I use pastels, hands, a ruler for starting, and will soon start to add tape, and perhaps powder pigments applied with water or alcohol. Other than that, I have a pillow that an Italian merchant gave me during my first time street painting and a small pad to kneel on. I also have my plastic broom and water for washing up later. Sometimes I remember to bring baby wipes to clean myself up a little bit throughout the day. What are your intentions, if any, for an image as a final piece? My intentions are to maximize connection with the audience and to do good work. I have not been street painting long enough to have learned many tricks -- other than I suppose making sure one has a good night’s sleep prior to working. Has it rained while street painting? How did you deal/handle the situation. Oh -- yes, it has rained a lot while I have been painting, especially this March and April. Sometimes the rain is light and I can wait it out. other times, it pours and there is nothing to do, but get out my broom and clean the square before going home. Once, someone stole my umbrella as it protected my pastels while I was scrubbing my square. That was kind of a low moment. But other than that, most people seem rather sympathetic to the premature wash. One of my peers showed me how to use newspaper to dry the pavement that has not been drawn upon, if I choose to continue. The wet drawing cannot be touched. However, one day that it rained I was photographed for an Italian newspaper -- before it rained, naturally. But that was very cool! How do you physically prepare to do a street painting, isn't it really hard on the body? What are you tricks to keep from getting sore and tired? I have yet to not become sore and tired. My first time, I was sore for three days after! But like any physical pursuit, the more you do it, the more your muscles adjust and become stronger. I try to find the right balance in drinking fluids. Obviously, one does not want to get dehydrated, but also, I hate to be away from my work as I search for a public restroom. I bring foods that keep well, cookies, boiled eggs, some fruit. 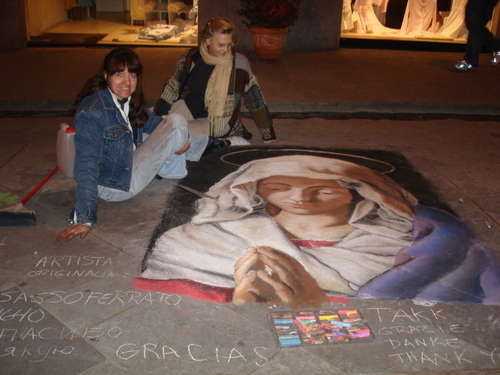 We understand that a number of street painters in Italy make their daily living by street painting please share your thoughts (narrative) on the experience of street painting in the traditional lifestyle for US street painters and fans of the art form. Perhaps my first one - The Blue Madonna by Carlo Dolci will always have a special place in my heart. But I also enjoy drawing the Libyan Sibyl on the Sistine Chapel by Michelangelo. People seem to love the way I draw the musculature. Do the audiences vary from one festival to another? Audiences vary day to day. Always.